Ereza Apartamentos Los Hibiscos is a pocket friendly contemporary hotel that features three-star facilities and amenities. 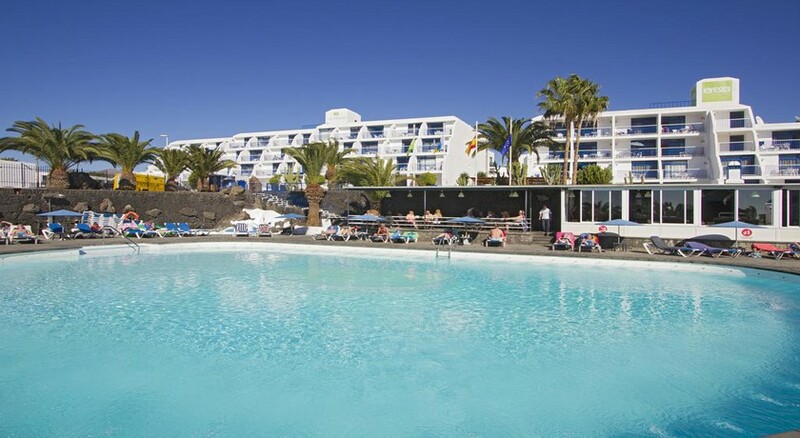 It’s mostly celebrated among couples (both young and old) and large family who wish to have a fabulous seaside holiday in Puerto del Carmen—it offers all-inclusive, half-board and full-board accommodations. Guestrooms in Ereza Apartamentos Los Hibiscos are divided into One Bedroom and Two Bedroom apartments. Decorated using a fixed colour (white and violet), the accommodations are bight and fresh. 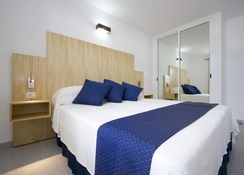 Common facilities across the rooms include: air conditioning, TV with satellite, private bathroom, fridge, functional kitchenette, safe deposit box, and wooden furniture. Rooms have either twin beds or double bed, depending on availability, but each unit has a private balcony—all the rooms face thye poolside. The main restaurant serves breakfast (8am to 10:30am), lunch (1pm to 3 pm) and dinner (6:30pm to 9:30pm) in buffet style. Fresh and well-presented, the covers include chef’s specialities and selected local and international cuisines. The main bar that opens between 10am and 12am serves a wide collection of local and international liquors, including premium wine and beer. During the day time, it’s mostly the poolside snack bar that caters to guests. It serves an array of cocktail, mocktails and other non-alcoholic drinks including snacks and light bites. Ereza Apartamentos Los Hibiscos features a large outdoor swimming pool that come fitted with umbrellas and sunbeds. In the adjoining there is a children’s paddle pool—lilos and towels are also available. The game arcade provides billiards, darts, table tennis and few other regular board games. In addition, you can rent a bike from the front desk and go explore the town, and the children can make use of the playground while you relax by the poolside. 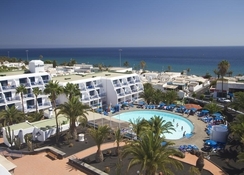 Located about 200 metres from the beach, in Doramas, Puerto del Carmen, Ereza Apartamentos Los Hibiscos is a three-star hotel. The complex is built around a swimming pool and offers 142 modern guestrooms, all furnished with a balcony. There are plenty of restaurants, bars, clubs and shops around the hotel, but just in case you want to explore the neighbourhood, Puerto del Carmen city centre is 2 km away. Distance to few important landmarks from the hotel are: Norwegian Marine (100 metres), Cesars Bowling (200 metres), Aqua Tickets Centre (600 metres), Boat Centre (700 metres), Grand Casino (1 km), Colina del Sol (1 km), Socio-cultural Centre (1 km), Casa Jose Saramago (1.2 km) and Rancho Texas Park (1.9 km)—the Lanzarote airport is 6 km from the hotel.